Front door designs are many and varied; period-style offerings still take inspiration from basic planked structures or, variants of the classic six-panel Georgian, or four-panel Victorian door. Glazing, too, plays a key role. When it comes to replacing an original front door, it is usually best to consider a like-for-like design. Should a more modern stance be appropriate, mix and match styles — just ensure the door still works with the architecture and proportions of your home. Find out how to choose a new front door or how to restore your original front door. A bold painted door can make a striking contrast with an otherwise neutral facade. If you fancy a weekend DIY project, you can paint your door yourself, or buy one that has been pre-painted. A modern take on early-20th-century designs, Urban Front’s timber planked Como door (below) features a large oval vision panel and can be hinged (up to H240cm x W104cm) or pivoted (up to H240cm x W120cm). Available in timber and painted finishes, it is shown here in Fire Engine Red, £5,316. Combining a colour that draws the eye with sleek horizontal grooves makes for a stand-out front door. Period homes require you to choose replacement doors to suit your home's style. If you are lucky enough to have an original door, then all you need to worry about is maintenance – and draughts. Alternatively, pick a new design that is sympathetic to period styles, but will provide better insulation from the elements. Linton Cottage Door In Agate Grey with wrought iron by Evolution (below). Find more traditional front door design ideas in our design gallery. Inspired by Georgian designs, this six-panelled door from Westbury Joinery (below) features two double-glazed units at the top to increase light levels without compromising on privacy or traditional style. Made from a combination of larch and accoya, and finished in three coats of microporous Westbury White paint, it costs around £1,900 for H210cm x W110cm. The stable door version of the Elite Keswick in Mouse Grey (below) has country charm. Made from Medite Tricoya Extreme, sapele and engineered timber, it costs from £2,976 for a door and side panel, Anglian. For historical accuracy, look to reclamation yards and specialist dealers, which can offer advice on appropriate designs for the door itself, as well as ironmongery. If you opt for a reclaimed front door, inspect it closely to ensure the wood is a not warped, cracked or showing sign of rot. Should a suitable size be unavailable, most doors can be trimmed by up to 25mm without an adverse effect. Made from French oak, the made-to-measure Manoir arched planked door is internally ledged to ensure both faces are the same. A matching frame allows for housing within a square opening, or it can be made for an arched opening. Supplied unfinished or oiled, from £1,981 for up to H210cm x W90cm (bespoke sizes on request) at Broadleaf Timber (below). Looking for a front door that suits a traditional country cottage? A diamond window and fuss-free horizontal panels make this Nordic wood core door the perfect partner to lattice pane windows and rustic architecture. Solid Core (below), typically £995 installed, Door-Stop International. In terms of replacement doors, off-the-shelf designs and door sets can prove an ideal solution if you’re conscious of cost, but styles are restrictive and sizes standardised – unlike the entrances of many historical homes. A more flexible option for period homeowners is to go bespoke, as this offers infinite possibilities in terms of size, style and material. This made-to-order vertical oak plank entrance door (below) is part of Mumford & Wood’s Conservation range. Crafted from sustainable, engineered timber using traditional methods, it’s supplied with high-quality locking systems, ironmongery and three coats of factory-finished paint or stain. From £4,314, including sidelights. If your home is north-facing or low-rise and tends not to get enough light, opt for a front door design with glazing. Jack Brunsdon & Son offer a fully bespoke service, allowing you to specify every component of the door, from material and finish to glazing and furniture. Painted in a heritage green shade, this half-glazed design (below) is perfect for maximising light in a dark interior. From £3,500, including installation. If you're looking for something a little more contemporary, consider opting for a door with a long glass panel. This Shardlow Glazed Door (below) from LPD Doors at Wayfair is perfect for brightening a dark hallway. It costs £699.99 for H203cm x W89cm. Historically, pitch pine was the timber of choice for front doors. However, these days a high-quality, traditionally crafted exterior door is far more likely to be fashioned from durable hardwood, such as oak or, increasingly, accoya, a chemically modified timber that outperforms hardwood in terms of strength and stability. All external doors should be fitted with high-security deadlocks and, in order to ensure adequate strength and protection against intruders, they should be made of a solid-core construction that is at least 44mm thick. This will also aid heat and sound insulation, as does the use of slimline heritage double-glazing. For authenticity, timber doors can be finished and maintained using quality linseed oil, wax, or microporous paint, culminating in a weather-tight barrier that is both aesthetically pleasing and secure. Choosing quality paint for your door is crucial to achieving a polished look. If painting the door yourself, choose a durable exterior paint, such as Intelligent Exterior Eggshell by Little Greene or Weathershield by Dulux. Alternatively, choose a quality pre-painted door. The made-to-order timber doors from The Sash Window Workshop (below) are handcrafted from accoya or European oak. They are finished with at least three coats of factory-applied paint, or can be hand-waxed on request. Prices on application. If a solid wood door is out of your price range, there are plenty of engineered wood options available. Offering many of the same benefits as solid wood doors, they are made from blocks of different types of wood that have been assembled – or engineered – into a single composite material. Own a period home and want the real thing, but your type door hasn't been made for centuries? It might be easier to procure a well-crafted replica than you think. Look for a door maker that specialises in period designs and traditional techniques. 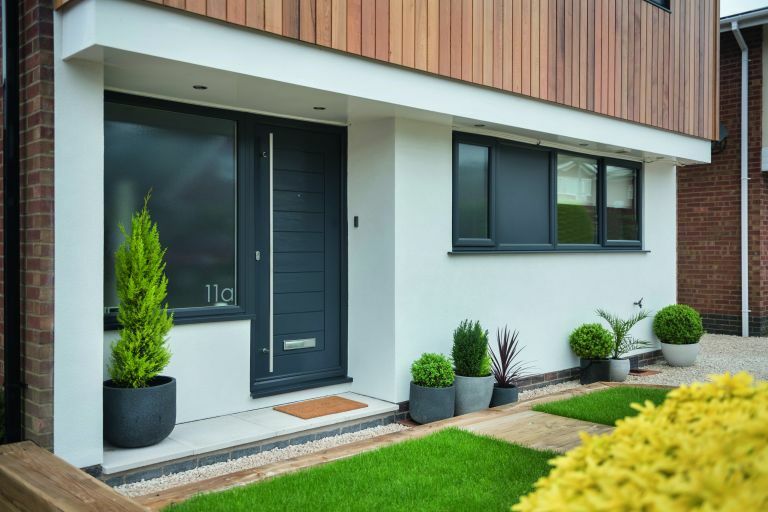 If you don't want to spend the time – and incur the expense – choosing a bespoke front door design, but still want something that will go perfectly with your home, why not go for a customisable range? Available in almost 100 designs and in choice of 16 finishes with a wide variety of glazing options and door furniture, Everest’s composite range is not just sturdy, low maintenance and energy efficient, but can also be customised to complement the style of your home. This Grove design (below) in Everest’s Chartwell Green costs from £2,000 made to measure and installed. RK Doors’ Excellence Range allows you to choose your door style – like this 4090 model (below) – before customising with colours and accessories. From £1,995. You don't always have to have a traditional door – even if you live in a period property, but especially if your home is an urban new build. Experiment with a bold modern design in a striking colour, especially effective as a contrast to concrete and glass. The sleek Porto door (below) from Urban Front is vertically grooved and will make an effortless addition to any design. If you're looking for a door with a sleek finish, the ThermoSafe Style 565 (below) from Hörmann, with its aluminium finish, offers a stylish solution with the added benefit of effective heat and sound insulation. This H191cm x W85cm door is £3,927. With an external finish of oak and a central stainless-steel band, this contemporary front door has a distinctly crisp look. If that's not your style, it also comes in other finishes such as marble, stone, metal and glass. Include in a wall opening or surround with frameless glazing for a front door that makes a lasting first impression. This version (below) is H250cm x W180cm and costs around £11,000 for design, supply and install in London, from IQ Glass. Available in 23 colour options, the Palermo door (below) is perfect if you're looking for a contemporary door in a specific colourway. Match with the rest of your exterior fixtures and fittings for a faultless and cohesive finish. From £900 for a door set, Solidor. If security is top of your front door criteria, this hardwood timber FunkyFront Door (below) from Klöeber could be the option for you. Laminated for strength, it offers the utmost in security, without compromising on its stylish and contemporary design thanks to Hamburg style panels. H210cm x W300cm, £3,130 supply only, Klöeber. Top lights are also a great option if you don’t want people to see in from the street, but if you’re not overlooked, pair with side lights. Wood-effect uPVC door in French Grey (below), H210cm x W90cm, £3,000 including installation, English Door Company. A Victorian home that’s lost an original door along the way can be restored to glory with a traditionally-inspired design like this one. The four-panel door (below) has authentic heavy mouldings and is painted in dark grey, which complements the tiled path. It has been made from solid accoya wood, which is treated to be extremely durable and stable, and is finished with smart polished chrome door furniture. From £2,400, London Door Company. The semi-circular window and four-panel design of this Carolina Glazed door (below) evoke the Georgian era. It is engineered wood, ready to be painted or stained. Price on request, Howdens. If you're concerned about saving energy (and wouldn't mind spending less money on bills) it's worth looking into the energy efficiency of your front door before investing. Designed to limit heat transfer out of your home, this smart door with Thermimax core and aluminium layers will keep you snug. Residential in panel option TR05 (below), from £2,160, Origin.